[150 Pages Report] The global oil accumulator market was valued at USD 467.9 million in 2017; it is projected to reach USD 617.1 million by 2023, at a CAGR of 4.78%, during the forecast period. Digital revolution in the oil & gas industry and increased exploration and production activities in countries such as China, India, Australia, and Indonesia are driving the market for oil accumulators. The base year considered for company profiles is 2016/17. Whenever information was unavailable for the base year, the prior year has been considered. This research study involved the use of extensive secondary sources, directories, and databases, such as Hoover’s, Bloomberg Businessweek, Factiva, and OneSource, to identify and collect information useful for a technical, market-oriented, and commercial study of the oil accumulator market. Primary sources are mainly industry experts from the core and related industries, preferred suppliers, manufacturers, distributors, service providers, technology developers, standards and certification organizations of companies, and organizations related to all the segments of this industry’s value chain. The points given below explain the research methodology. Some of the leading global manufacturers of oil accumulators are Hydac (Germany), Parker Hannifin (US), Eaton (Ireland), Freudenberg (Germany), Bosch Rexroth (Germany), and Nippon Accumulator (Japan). The oil accumulator is estimated to reach a market size of USD 488.5 million in 2018 and is projected to reach USD 617.1 million by 2023, at a CAGR of 4.78%, from 2018 to 2023. Increase in exploration and production activities in countries such as China, India, Australia, US, and Indonesia are the key factors driving the oil accumulator market, during the forecast period. The report segments the oil accumulator market, by pressure range, into up to 6,000 psi and above 6,000 psi. The up to 6,000 psi led the oil accumulator market in 2017. The up to 6,000 psi market is mainly driven due to application of multiple units in place of a single unit to avoid idle time during production or drilling. The global oil accumulator market, by type, has been segmented into bladder, piston, and diaphragm. The bladder segment is expected be the largest market during the forecast period. 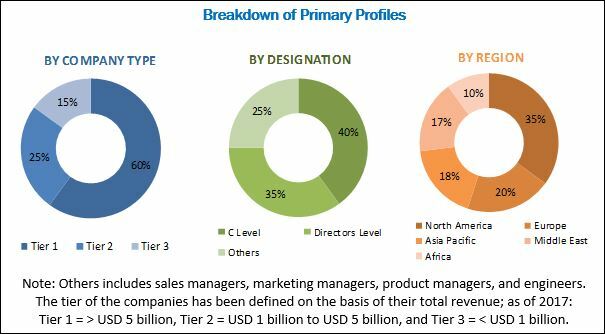 The growing demand for bladder accumulators is attributed to the increased Exploration and Production (E&P) spending and use in Blow Out Preventer (BOP) applications worldwide, which are driving the bladder accumulator market. High investment in onshore and offshore activities in emerging economies will create new revenue pockets for the oil accumulator market. The report further segments the oil accumulator market, by application, into blow out preventer & well head control, offshore rigs, and mud pumps. The blow out preventer & well head control segment is expected to grow at the highest CAGR during the forecast period. BOPs are used in both onshore and offshore activities. North America led the BOPs & Well Head Control market because of the increase in exploration and drilling activities. In this report, the oil accumulator market has been analyzed with respect to 5 regions, namely, Asia Pacific, Europe, North America, South America, and the Middle East & Africa. North America is expected to dominate the oil accumulator market, during the forecast period because of massive shale deposits in the US and continuous offshore drilling activities in the Gulf of Mexico. The figure given below shows the projected market sizes of various regions with respective CAGRs for 2023. The major factor restraining the growth of the oil accumulator market is transition to renewable sources of energy. 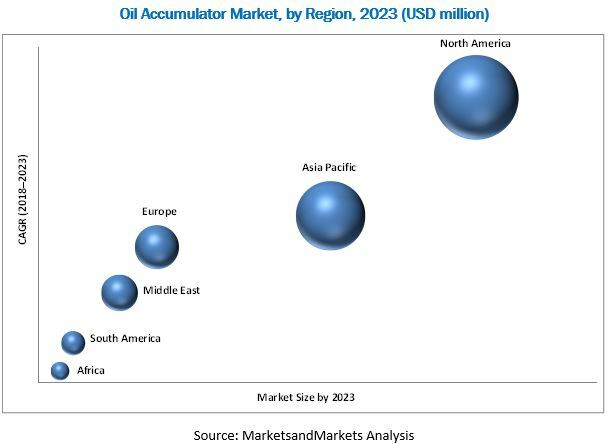 Some of the leading players in the oil accumulator market are Hydac (Germany), Parker Hannifin (US), Eaton (Ireland), Freudenberg (Germany), Bosch Rexroth (Germany), and Nippon Accumulator (Japan). These players have adopted growth strategies such as contracts & agreements, mergers & acquisitions, and partnership & collaborations to capture a larger share of the oil accumulator market.